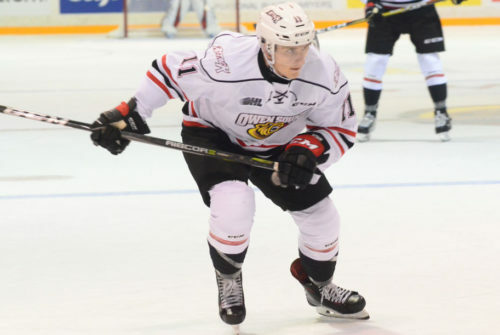 That is, Owen Sound forward Daylon Groulx and Attack defenseman Andrew Perrott are sons of two former standout Greyhound players from many years ago. Groulx is the son of Wayne Groulx, who is merely the all-time points leader in the 47 year OHL history of the Greyhounds. The elder Groulx, who played four fabulous seasons for the Greyhounds from 1981 to 1985, put up mind boggling numbers as a 5-foot-9 center for the Soo. Regular season and playoffs included, the now 54-year old Groulx scored 232 goals, 347 assists, 579 points in 328 games as a Greyhound. His 579 points are the third most of any player who has ever skated in the OHL. After being obtained from Oshawa for third round, sixth round and ninth round picks, the 6-foot, 200-pound Perrott was well worth the exchange as an overage forward for the Soo that ’96-97 season. Regular season and a lengthy playoff run included, Perrott had 23 goals, 28 assists, 51 points in 48 games for the Greyhounds while racking up 180 minutes in penalties as one of the more feared fighters in the OHL. The now 42-year old Perrott then went on to a lengthy professional hockey career that included 89 games in the NHL for a number of teams, including the Toronto Maple Leafs. As for the sons of Groulx and Perrott, both are becoming established OHL players in their own right. Prior to this season, the hard-nosed Groulx, who plays bigger than his 5-foot-11, 175-pound build, scored 13 goals as a full-fledged rookie for Owen Sound in 2017-2018. He was a fourth-round pick of the Attack at the 2016 OHL priority selections draft and scored one goal in nine games as a call-up to Owen Sound during the 2016-2017 season. The 6-foot, 200-pound Perrott was drafted by London in the second round of the 2017 OHL priority selections draft and had 4 goals, 5 assists, 9 points in 62 games as a 2001 birth-year rookie for the Knights in 2017-2018. And it is now, while playing for Owen Sound, that Groulx and Perrott will be facing off against a Greyhound team that lists both of their dads as big parts of the Soo’s OHL history. As noted, the Greyhounds and Attack will meet in the first round of the OHL playoffs. PHOTO: Owen Sound Attack forward Daylon Groulx. Great stuff Randy! One of my all-time favourites! Hopefully before or during the team’s fiftieth Anniversary they can acknowledge his contributions to this organization! 477 regular season points, 187 goals,290 assists in 267 games! Those are gawdy numbers, most definitely worthy of a sweater retirement and a banner high above GFL ice! thanks Chris and … add up the playoff totals as I did and you have even more astronomic numbers! Very nice article and thank you for the kind words , from both Daylon and myself !! To say the least , the Groulx family was pretty excited to see another Greyhound – Attack playoff series . It will be a tough task for sure for this OS team to push the hounds to an extended series like last season but they’ll battle hard and hope for a few bounces their way . I’ll probably be making the drive North so hopefully we can get together and chat about “the old days” . Also hoping Chris will be around , his “news and articles” from the past are just so awesome to read !! You are right to sat that Daylon and Andrew are part of the future of our very young hockey team. I might say, big parts. These two lads have great OHL pedigrees, terrific, supportive families and the drive that will carry them to their full potential. We look forward to seeing how they and their young teammates do against a very good SSM team. You mentioned the retiring of great player’s numbers. I’m all for honoring a former player by hanging his sweater and name from the rafters, but I would like to see other future players allowed to wear the same number. wore 2, 3, 4, 5, 6, etc. and the forwards wore 7, 8, 9, 10., etc. I still can’t get used to 55, 73, 82, 94…………100 ?????? Thanks, Ronnie and good point about the numbers. Having said that, Wayne Groulx should have a banner with his name and no. 9 hanging from the rafters at GFL Memorial Gardens. Adam McMaster, 2016; Brady Lyle, 2015; Zach Poirier, 2014; and Brett McKenzie, 2013. The first 3 of these were Battalion first-round picks, while McKenzie came to the Bay later. This information is from a current article on ‘Bay Today’, and I’ll have to trust the source for its accuracy. Hope you find this of interest. Cheers! Wayne Groulx’s number not being retired, is appalling! The past and present Greyhounds front office, should be embarrassed! Those numbers are mind boggling!! Wayne Groulx’s number should’ve been retired a long time ago. Many great memories of his playing days.